75 days. Compact indeterminate. 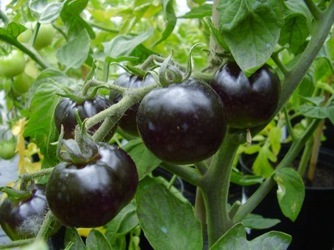 Darkest tomato bred so far, exceptionally high in anthocyanins. Green when unripe, purple-red when ripe, the 1-2 oz., cocktail-sized tomatoes have good flavor with 'plummy' overtones.